Does the crisp, fall air make you want to get outdoors? The Village at Reflection Lake Nantahala, an exclusive lake and mountain view community, is offering a free day at the lake until September 30. So, grab your fishing poles and hiking boots and travel to Topton, North Carolina! Potential buyers will be treated to lunch at the famous Lakes End Diner, a $25 gas card, a pontoon boat tour of the lake, a tour of available lots and a chance to win a weekend at the lake in a cabin. Plus, guests can also experience other outdoor activities that are perfect for fall. Put those fishing poles and hiking boots to good use! Lake Nantahala has inviting waters for boating and fishing. Additional activities near the lake include hiking, camping, rock and waterfall climbing, horseback riding and golfing. The Village at Reflection Lake Nantahala features home sites priced from $94,900 to $129,900. There is no build-out requirement, so buyers can take their time planning their dream vacation homes. When completed, cabins will have incredible views of Lake Nantahala. A standard cabin features 3,023 square feet of space with three bedrooms and three-and-a-half baths plus a loft. The kitchen includes granite countertops, stainless steel appliances, a double sink with disposal and a sliding cutting board over the trash bin. The great room includes a wood or gas burning fireplace, timber mantle and custom, stacked-stone surrounded with built-in bookcases. The master bedroom features a sliding door to a private, screened-in sleeping porch for open-air sleeping. In addition, the master bath includes a double vanity, tub, shower seat and walk-in closet. Residents will enjoy the community’s gated entrance, protective covenants, underground utilities, shared water wells and a park, which provides a shared pavilion, fire pit, camp site and golf cart parking. For more information or to schedule a day at the lake tour, call 866-218-8439 or visit www.lakenantahalareflection.com/thevillage. 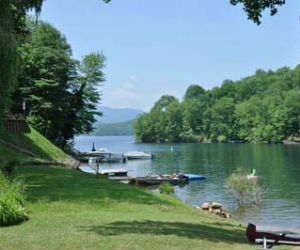 This entry was posted in Homebuyer Incentives, North Carolina and tagged Lake living, outdoor living, The Village at Reflection Lake Nantahala on September 14, 2011 by Carol Morgan.